1stAvailable (ASX: 1ST) has delivered a strong first half performance from a financial and operational perspective, while also forging some promising client relationships. 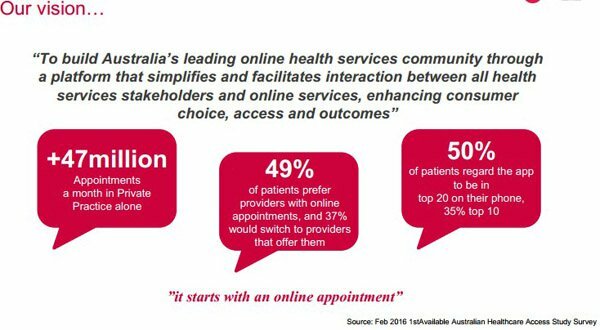 The company is an Australian online healthcare portal that simplifies and facilitates digital interaction between health services and consumers. The group provides cloud-based solutions including online search and appointment booking services for healthcare providers, reducing waiting times for patients and helping to automate healthcare providers’ administrative services. With healthcare services stretched it is not surprising to see 1ST continue its impressive growth trajectory. The company’s monthly recurring revenue for the three months to September 30, 2016 was $193,000, representing year-on-year growth of more than 40%. Furthermore, monthly new consumer registrations have increased by 400% to more than 20,000 a month since July 2015. This positions the company strongly in terms of generating robust recurring income. However, we should remind readers that investment decisions should not be based on forward looking statements or historical share price performances alone. Investors should seek independent financial advice if considering this stock for their portfolio. In tandem with today’s quarterly update, the company announced that it had negotiated a new subscription agreement with a major dental corporate client. Under the agreement, the 1ST platform will be rolled out initially to their New South Wales dental centres which accounts for 130 dentists. This represents a substantial increase in the company’s share of the dental market with its customer base already including Primary Health Care’s dental division and the Pacific Smiles group. The company has also made impressive inroads into the optical healthcare market with its clients including high profile organisations such as Bupa Optical, The Optical Company and a major group of independent optometrists. This area of the company’s business is expected to be a strong growth driver in the December quarter. 1ST’s services also extend to the luxury cosmetics market where new agreements have been negotiated with leading retailer, Napoleon Perdis which involves the rollout of its platform of 85 stores and six academies. This will assist in generating subscription revenue for the company. These developments suggest fiscal 2017 will be an important transitionary period for the group, having established meaningful positions across the dental, optical and retail industries. 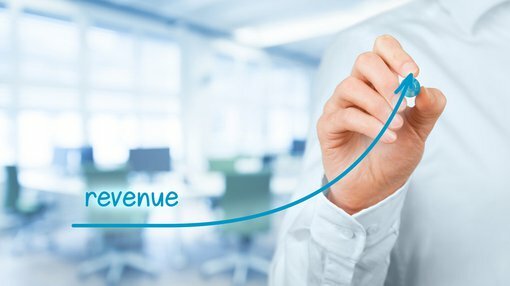 As highlighted by Managing Director, Klaus Bartosch, recurring revenue is a relatively accurate forward performance indicator, and with the company not far off generating $200,000 per month, 1ST is well-positioned to substantially outperform its fiscal 2016 annual revenue of circa $2 million. Having ended the quarter with a cash balance of $5.6 million, 1ST looks to have the financial backing that will go a long way to finding its growth initiatives throughout the rest of fiscal 2017, including investment in building sales across its healthcare markets and introducing new products which will provide additional sources of income as well as revenue diversification. Looking at near-term growth drivers, Bartosch said, “As subscription revenue grows, we increase the addressable base for our products which puts the patient first and will contribute to new transaction-based revenue”. It is worth noting that 1ST’s net tangible assets per ordinary security as at June 30, 2016 was circa 2.9 cents, indicating that its recent trading range of approximately 5 cents doesn’t accurately reflect the underlying value of the business, as well as its growth potential.